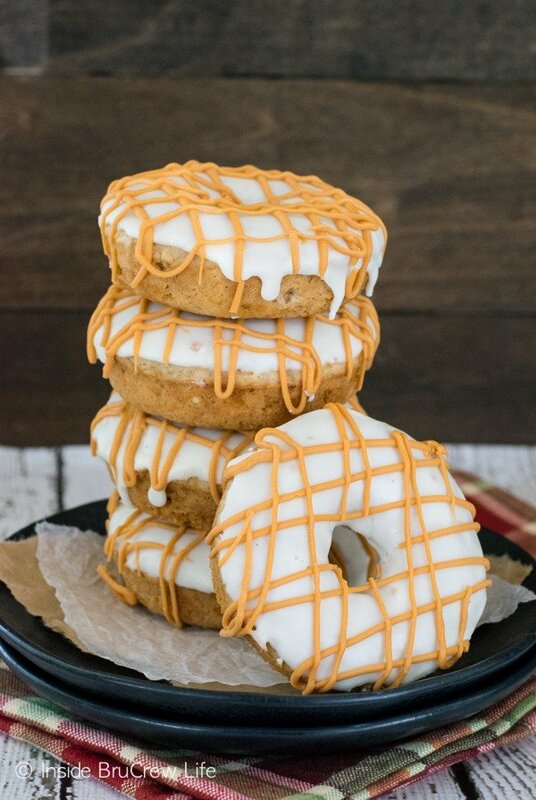 Adding shredded apples and butterscotch chips is a fun way to create a delicious donut. 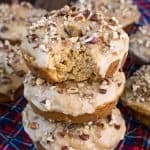 These Butterscotch Apple Cake Donuts are a great choice to make as a breakfast or after school snack for your children. They will get gobbled up in a hurry. *This post was sponsored by The J.M. Smucker Company. I am partnering with them this fall as a brand ambassador creating recipes from products that they send me. We are finally into a really good routine in the morning for school and work outs. It only took 5 weeks to get it down. I think that means the habit is set, right? The funny thing about our family is that we are not morning people. Usually there is someone in every family who just naturally wakes up early and is ready to go. That is not the case here. If we do not have alarms set, there will be no waking up until much later. That means that when the start of school comes, it takes a while for everyone to adjust to a new routine. As long as everyone does their own thing in the morning, we get along just fine. We have talked before about how breakfast does not happen early in the morning around here. What I mean is that I do not make breakfast first thing in the morning. If there is going to be muffins and donuts, I have to get a head start the day before. My brain and hands don’t communicate before 9 am. 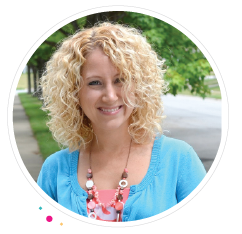 Most days our kids will grab a bowl of cereal or granola bars for a quick and easy breakfast. But then there are the days, I get creative in the kitchen and make fun cake donuts for them to enjoy. 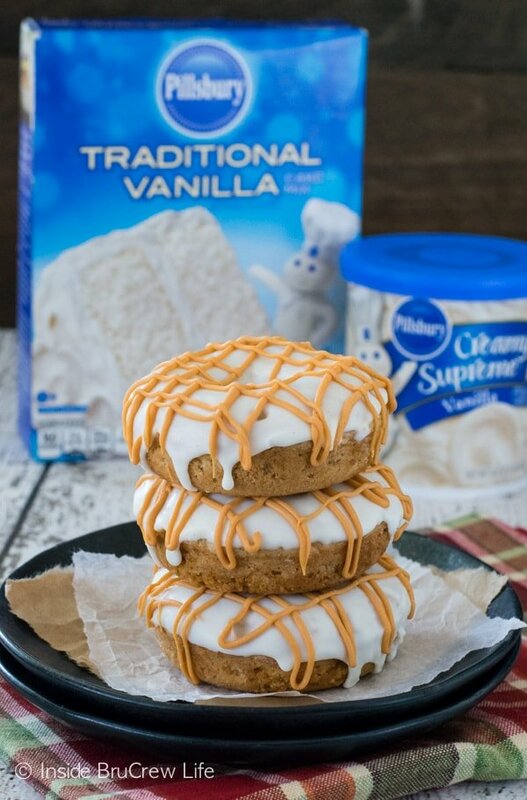 Pillsbury sent me a box of cake mixes and frosting to get creative with this month. I had so many different ideas on what I could make from each one that it was hard to narrow it down to one. But then I remembered that these chocolate covered strawberry donuts started from a cake mix, and I knew what I wanted to do. I just changed up the ingredients a little and gave it a fun fall flair. Every fall when the kids were little we would go to the apple orchard, pick apples, and drink apple cider. I have so many cute pictures of them holding up apples and trying to climb trees. If I would mention going to an apple orchard to them now, I think all three of them would give me that teenager look. You know the one, right? The look that says, “really, mom?” But I like to think they would humor me and my family fun ideas. 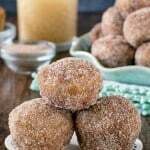 For these donuts, I used applesauce instead of any oil or butter, and I used apple cider instead of milk or water. That means these apple cake donuts got three times the apple love. There are so many different flavors that pair well with apple. I have done caramel, maple, candy, and nuts. As I dug through my baking cupboard, I saw a lonely bag of butterscotch chips and realized that it has been a while since using them in anything. 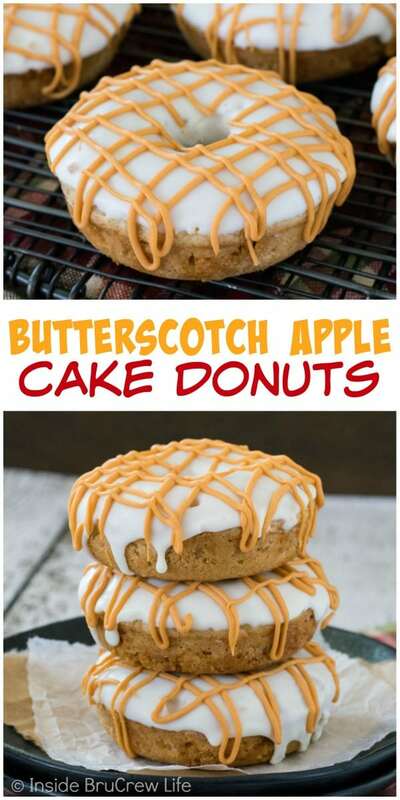 I had a feeling that butterscotch would give these apple donuts some pizzazz. Boy, was I right! Now just a word of warning regarding the donut pan and the butterscotch chips. They will stick slightly to the bottom of the hot pan. Make sure you let the donut cool in the pan for a few minutes before removing them. That helps the donut and chip stick together better. Also, let them cool completely before giving them a dunk in the frosting. 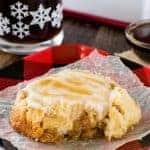 Did you know that you could use canned frosting as a glaze? 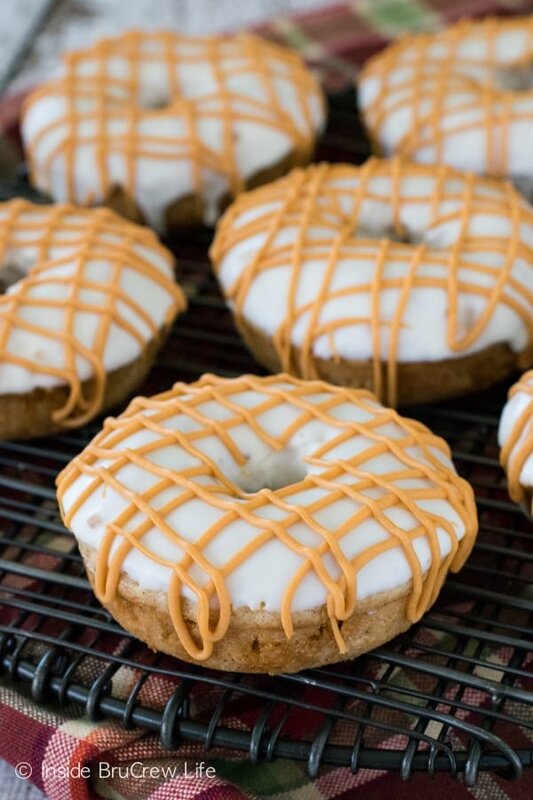 It’s a fun little trick I like to use for quick and easy donut glaze. Just make sure you do not over heat it, or the glaze will run right off the sides of the donuts. I might have learned the hard way. Go ahead and set the donuts on a plate and just watch them disappear. It’s a good feeling when you get texts saying how these donuts were the best thing ever. 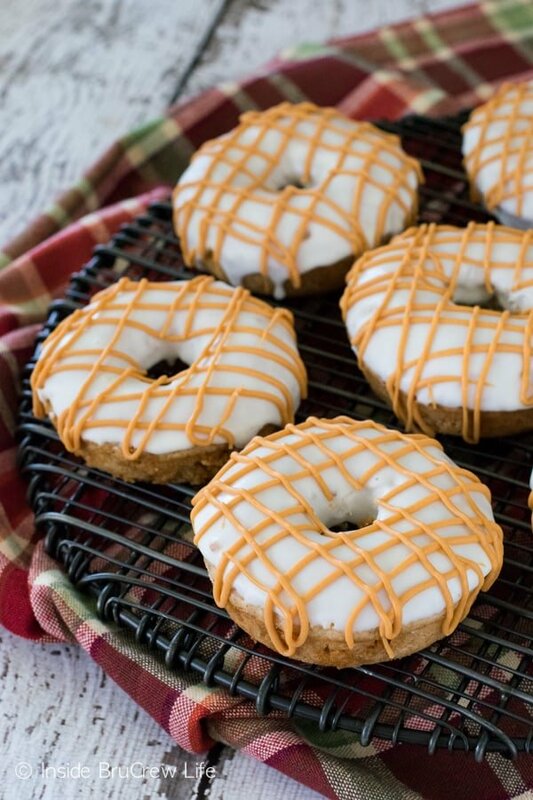 Butterscotch and apple give these easy cake donuts a fun fall twist. 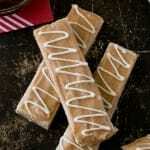 These are a great breakfast treat or after school snack. Combine the cake mix, applesauce, apple cider, eggs, and apple pie spice in a mixing bowl. Beat until completely combined. Press the shredded apple to remove as much excess juice as you can. Stir the apples and butterscotch chips into the cake batter. Use a flour and oil baking spray to coat the large donut pan. Spoon the batter into each cavity, filling it 1/2 to 3/4 full. Bake at 350 degrees for 10-12 minutes. Let cool in the pan 3-4 minutes before removing from the donut pan. Use a knife to loosen the edges of the donuts from the pan before lifting out gently. 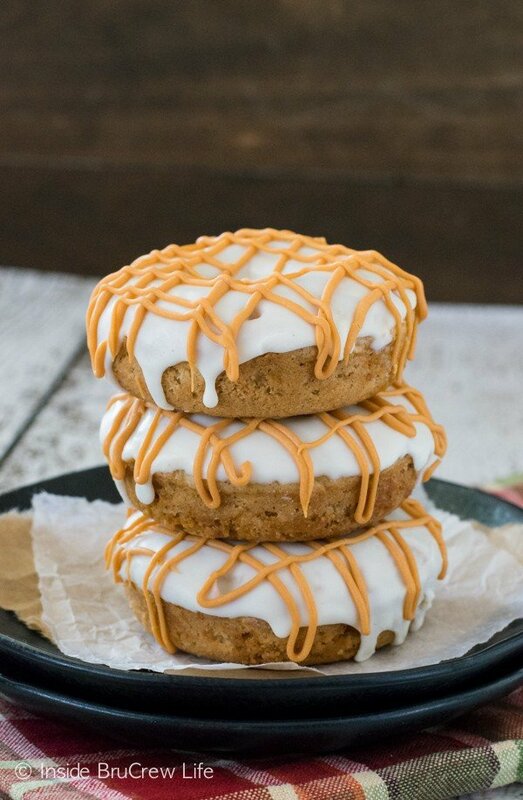 The butterscotch chips may stick to the pan, so use the knife to get under the donut as well when lifting. Cool completely on a wire rack. Place the frosting into a microwave safe bowl. Stir in the apple pie spice. Microwave for 30 seconds or until the frosting is pourable. Dip the top of the cooled donuts in the frosting. Let set. Place the butterscotch chips and shortening in a microwave safe bowl and heat for 30 seconds to 1 minute. Stir until creamy. Heat for 15 seconds at a time if needed. Spoon into a baggie and cut on tip off. Drizzle over the tops of the donuts. Store in a very loosely sealed container for 1-2 days. Makes 18 donuts. You make it hard not to read your post and lick my lips! 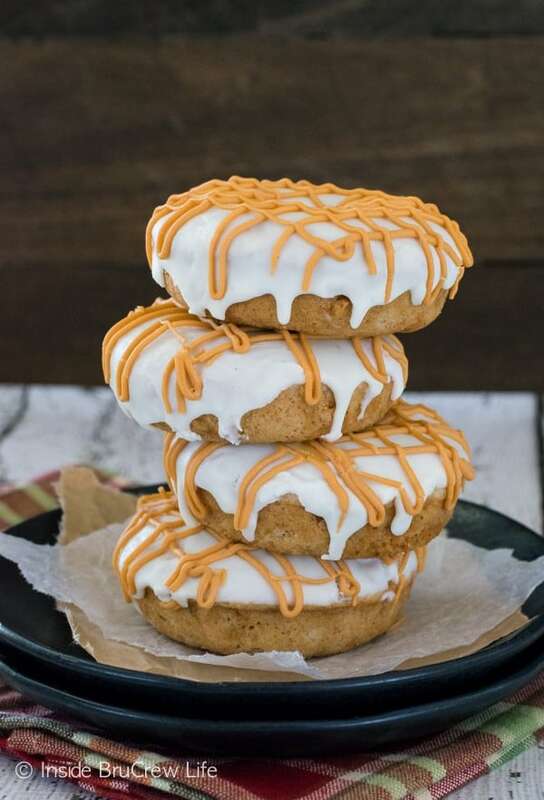 These donuts with shredded apples and butterscotch chips sound insanely delicious! My daughter isn’t a morning person – but I’m willing to bet she’d be up at the crack of dawn if she could inhale one of these! 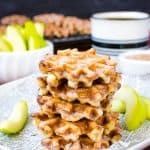 Love your use of apple sauce instead of butter/oil too! Apple and butterscotch just works so well together. Isn’t applesauce the greatest for cutting butter/oil?!?! Yikes to the early risers! I’m so thankful mine are not! And I’m totally wanting to make more donuts now too!!!! They look totally delicious! And I’m not a morning person, either. But – I do get up and prepare special breakfasts when the girls are here. I’m sure that’s something they will always remember you doing too. So sweet!!!! All that apple love is making my mouth water! These look so good. Butterscotch and apples seems like the perfect combination! Your donuts look beautiful and perfect. 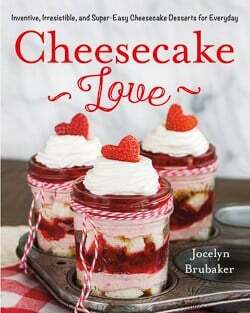 I wish I had one with my coffee…love the cake mix idea too! Thank you so much! Cake mixes are the best for fun treats like donuts and cookies! Oh do these donuts look good, Jocelyn! I would gladly devour an entire batch of these for breakfast. 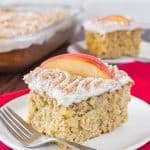 Love the butterscotch and apple combo! Mine is only a 6 count too. The recipe only makes 15-18 though, so I just keep them going into the oven until the batter is gone. I hope you enjoy the donuts! These look so incredible. The glaze on top is especially inviting. If I weren’t a morning person already, these would motivate me to get out of bed every day! Yep, funny how we’re all wired differently. I cannot stay up at night. Just cannot. But the mornings are happy time! It really does show us how we are all made differently and unique. I would gladly stay up late and sleep in in the morning! How fun! I love that you can use a cake mix to make donuts. That certainly helps anyone who might be a little intimidated their first time around. I don’t like mornings either, however my internal clock seems to be waking me up earlier and earlier each week. Oh, boo to the internal clock waking you up earlier. And yes, cake mixes are so versatile and easy to change up! I don’t have a donut pan, but would still love to make these as muffins. Look gorgeous, Jocelyn! Sharing. These would totally make great donuts too! You would probably just have to bake them 15-18 minutes. Yay for new donut pans! I hope you are having fun using it!